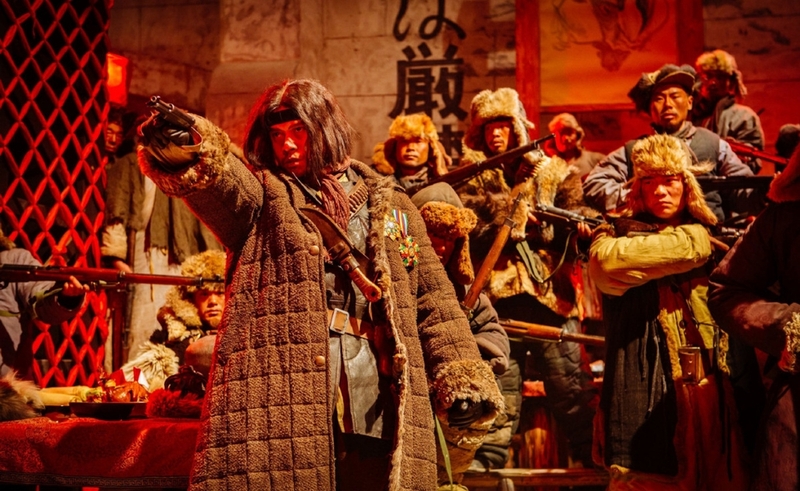 Tsui Hark’s historical war movie The Taking Of Tiger Mountain begins in 2015, in New York City at Christmastime, for two reasons. First and foremost, Tsui has said that he was on a mission with this project, intending to prove the value of a story that’s been firmly planted in the Chinese national consciousness for half a century. Like an old nursery rhyme or the nightly news, the Tiger Mountain saga has always been just sort of there, according to Tsui—part of the shared culture that’s rarely given its due as a unique piece of popular art. Qu Bo’s 1957 novel Tracks In The Snowy Forest was adapted during the Cultural Revolution into the opera Taking Tiger Mountain By Strategy, which was one of the original eight “model plays” performed around the country and used as source material for other media during the late 1960s and early 1970s. In 1970, the opera became one of the few state-approved movies, seen over and over by anyone who grew up in that era. Tsui and screenwriter Jianxin Huang make a virtue of Tiger Mountain’s ubiquity in the new film’s framing device, imagining a young, 21st-century Chinese man rediscovering a piece of his heritage when he hears a song from the old movie at a party, prompting him to do a little research into something he’d always taken for granted. The second reason Tsui opens The Taking Of Tiger Mountain the way he does is that it’s weird and unexpected; and this is a movie that in its second hour becomes increasingly bizarre, in ways that its fairly square first hour barely suggest. So Tsui starts the film with “Deck The Halls” and a sparkly Manhattan to serve as as a kind of warning that this Tiger Mountain will be about spectacle, not scholarship. Set in 1946 during the Chinese Civil War, the film stars Zhang Hanyu as Yang, a courageous People’s Liberation Army reconnaissance officer who discovers a thousand-strong horde of bandits in a seemingly impenetrable mountain stronghold, and goes undercover to see if he can bring them down from within—or at least keep them from slaughtering his tiny band of 30 soldiers. Tony Leung Ka-fai plays Lord Hawk, a cartoonishly evil crime lord—with an exaggerated nose and tufts of devil-horn-like hair springing from his bald head—who uses his extensive armory and his powers of manipulation to control an army of rogues, and to terrorize the surrounding countryside. Aside from one tiger attack, most of The Taking Of Tiger Mountain’s first half is the stuff of conventional war pictures, with exhausted men in ragged uniforms trading gunfire in a forbidding landscape. In the second half, though, Tiger Mountain becomes more like Tsui’s recent CGI-heavy “Detective Dee” movies, with lots of bright color and outlandish action. The film was originally exhibited in 3-D, and while Well Go USA’s Blu-ray is 2-D, it’s still dazzling, with its vertigo-inducing vistas, flying bullets, and spurts of blood. The last hour also has a lot in common with Hong Kong’s anything-goes 1980s/1990s action blockbusters. Tiger Mountain ends with an epic extended battle sequence, culminating a sustained attack on Lord Hawk’s fortress that involves tanks, zip-lines, and a hidden airplane on a subterranean runway. The Taking Of Tiger Mountain was released in China in late December of last year, and is already the country’s 12th highest-grossing film of all time. (It was the 10th, until Furious 7 and Avengers: Age Of Ultron passed it.) American audiences are less likely to be stirred by the movie’s direct appeals to nationalist pride, exemplified by the ultimate endpoint of its modern-day plotline, which sees the young New Yorker visiting his grandmother in the very mountainside village that the PLA liberated. But Tsui does fulfill his primary goal here of making a classic newly relevant—not just to younger Chinese viewers, but to anyone who likes action. There’s something universal about honor, sacrifice, and gun-toting dudes on skis. The Well Go USA Blu-ray of The Taking Of Tiger Mountain adds short, blandly promotional interviews with Tsui and all four of his key cast members. All toe the same line, reiterating that their main objective with this film was to freshen up a well-worn story, though they also say that they tried to remove it from the realm of broad-stroke heroic fiction and make it more human-scaled. The freshening they accomplished. But human-scaled? Not at all… thank goodness.